Climbing Frames and Rope Frames are some of the most important and versatile items of equipment in the modern gymnasium and sportshall. Our range of frames offers an extremely wide choice of activities for all ages and levels of ability. 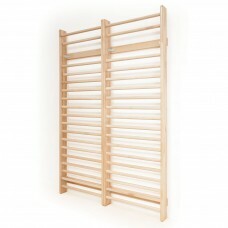 Niels Larsen Climbing Frames have been re-designed to ease the process of selection and installation. In conjunction with our Price List, simply sele.. Spectrum, or Y hinged frames are perhaps the best option for the school gymnasium and are now one of our most popular product ranges. The space saving.. 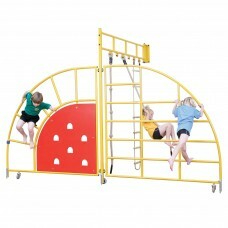 Suitable for use at Key Stage one, the Gym Centre consists of three frames each with a different range of activities. The frames are joined and open i..
Hinged booms are now the most popular and versatile arrangement in gymnasia, due to the generally high roof space in modern buildings. Our units are ..
Increasingly popular units, especially where an unsuitable roof structure prohibits the use of an overhead trackway. The combination of a diagonally ..
A very colourful timber frame particularly suited to schools where space is limited The frame comprises 3 gates, inco..
A colourful and robust Climbing Frame suitable for use in Key Stage 1 and 2 activities.It is constructed with 32mm dia tubular steel within a 50 x 25 ..
A quintessential element in gymnasia, and familiar to generations of gymnasts, Niels Larsen wall bars are featured in countless installations, both in..